I need a technique to do collect output in my LaTeX document. So, my LaTeX document will be exactly same with any LibreOffice document in which a single file contains all resource files. In LaTeX terms, collect output is called bundle. The tools to do that is bundledoc. 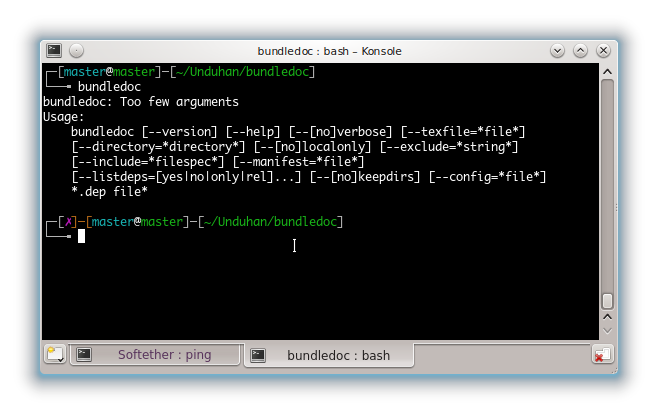 bundledoc main purpose is to collect all resource files (LaTeX calls them dependencies) and package them into a single tarball file. Exactly same with what I need. In Ubuntu, bundledoc tool contained inside texlive-extra-utils package. It is an official package and my Precise already has this package. 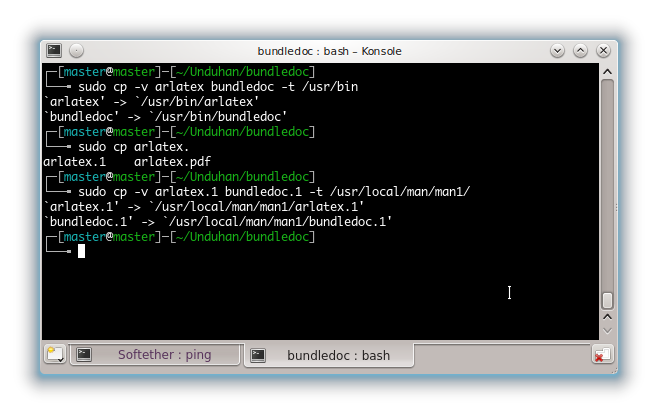 But the problem is texlive-extra-utils in Precise didn’t contain bundledoc package. texlive-extra-utils in Vivid has. So how to resolve this problem? Diagnose first. Compare them. Precise here, Vivid here. Found the problem. Precise has no bundledoc. Search for texlive-extra-utils for Vivid. Found it in Launchpad. Open the package download page for that package in Launchpad. Install with –simulate argument. See the output. Apparently, texlive-extra-utils for Vivid is no way compatible with Precise. It breaks texlive-base package in Precise. I failed with automatic package management system. These steps are deprecated. 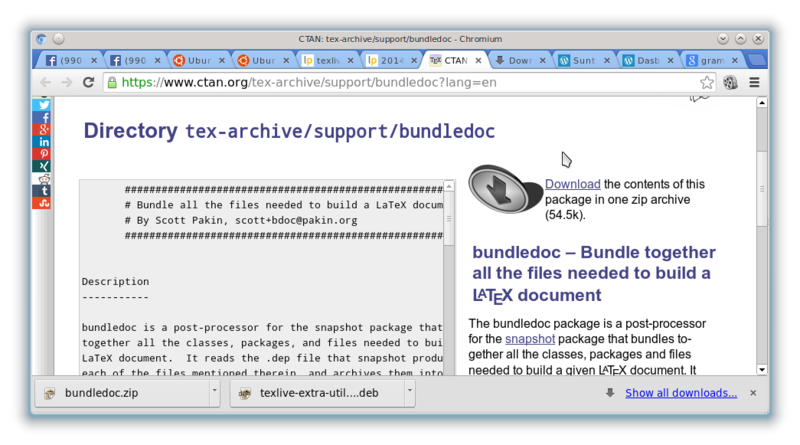 Special for LaTeX, actually we can install any new package by downloading the package files from CTAN. It is a big example we knew for years happened in LaTeX (CTAN) and Perl (CPAN). Big example for manual package management system. Copy the binary package to binary executable search path. I copy bundledoc package to /usr/bin directory. Copy the manual package to manpage executable search path. I copy bundledoc.1 package to /usr/local/man/man1 directory. Thanks to HEX Cube to pointing me there. If we can do reducing Ubuntu screen brightness via command line, and we now can create an application to run any Linux command line, then next we can make an application to do xrandr command above from GUI. Just slide and you can save the brightness setting. Or further, you can create any preset and use them any time you need. What Kind of Application Packaging? I wanna write such this article since I know the concept of dynamic library in Linux as a contrary of static library in Windows. Why I wanna? Because this difference made Linux disliked by most users in the world. Hey, I want you to use Linux as me too. I don’t have interest to explain technical-style what is library concept, but I only need people understand. Surely, this article contains purely my opinion. Concepts of new installation system in Linux. Although happen redundancy (duplicating install) some parts of another applications. But you don’t care enough because your HDD is in 100++ GB or even TB. Freedom along with users to install. No redundancy but your head could become sick. Too many another things should be installed along even just wanna install Marble Globe Application. I select it from Synaptic and apply. Wow, it looks like many another applications following Marble to be installed. Time felt so long for install (read: download). Advantage: if you install another application from KDE Education Package such as Kgeography or Kalzium or Kturtle, you don’t need to repeat what anything together with Marble has downloaded. As short I know, this is named dynamic linked library style. Disadvantage: usually users don’t need another. User often just need 1. Okay if user has MB/s connection at home plus Synaptic plus enough fast server. But how if the user belongs to poor country where is no fast connection? So user should download one by one Marble and another applications along it (Linux advance usually call them dependencies)? User should go to one page, then follow instruction “this program needs program C” then follow again “program C needs program D” then follow again “program D needs program E” and next until infinite? No. It is unsmart installation system. In Windows, imagine, imagine if you want IDM application, you will also install 100 another applications (dependencies) have to be installed in one time. But, you enough download 1 EXE contains 101 things. In Linux, imagine, imagine if you want Marble application, you will also install only 50 another applications (dependencies) have to be installed in one time. But, you should download them 51 things separately. They are not packaged in one compact installer. I ask you: which is easier? Which is simpler? Problem: What I typed in disadvantage paragraph is the origin installation system of Linux. Users often love Windows ways. Although it will eats many spaces, okay. Please let user gets all in one packet. It is compact. It will ease user. You can use IDM directly. Enough with one single download. You should download the single installer only. Then the next-next-next system only happen after the program download finished. So, there is no headache. It is should no too many next words in the web, just package them only in single installer, and let the installer verboses in our machine. Don’t let user becomes sick on downloading what he doesn’t know (majority of users don’t know programming). Hah? There is solution yet? Oh, alhamdulillah. All praises to Allah. I life with Linux users for some times. I learn from them that solution is always exist. Now hear. Sure, this solution generates some problems again. The Ubuntu version must be same → okay. How if he absolutely doesn’t know Terminal? → go to solution number 4. How if my Synaptic didn’t save yesterday downloaded program? → avoiding better than curing. Set this at Preferences > Files TAB > check at first radio button. Check what program you want to give to your friend. Say: Testdisk. Click on Give a Friend button beside Apply button. Choose your folder to save. Wait for seconds. Synaptic is making single installer. Successfully created at /home/you. You can copy it to your friend’s machine. And if you want, you can give it to 10.000 friends. My solution number 3 and 4 are orders for you developers who wanna keep your security awareness or something called ideology. It is your right, Dude 🙂 Nobody forces you. I hope somebody feels unsatisfied with Canonical or Red Hat or any major Linux makers, will take this ideas for creating new Linux distro. A “waiting for so long” distro which is dreamed by many users. Dream which is never be attended by most Linux developers. Who will realize this idea someday? I don’t know. Temporaryly, I have satisfied with nowaday Linux system. Ahamdulillah. Offline Installer for Ubuntu 12.04. Cara Singkat Membuat Offline Installer Ubuntu 12.04. If you don’t understand Indonesian, you can use Google Translate. You know, what the seed I mean? It is Keryx. An application for downloading app completely with dependencies. If you have not know yet, simply think Synaptic in Windows for downloading applications only and save them to a folder. Aha, that is Keryx. This application runs in Windows (innovative) for helping Linux users in slow connection country. So, in internet cafe (in Indonesia, internet cafes serve majority users who don’t have internet connection; and most internet cafes in Indonesia use Windows) we can run Keryx and download all applications via Keryx, save to flash disk, and install them at home. This app simplify installation in Linux. We can make .run file contains all apps downloaded by Keryx. And this single .run file can act like .exe in Windows. Wowowo, future! I have not use Keryx until now but I feel it is bright way for future Linux installation system. I admit that Keryx has not meet all my imagination criterias. But this app seems will inspire many new developers to build new comfortable installation system. It is okay. And hope is still flying 🙂 Thanks for reading! xlx on LibreOffice Icon Redesign: Who Can Do? All Linux terms in this blog generally refer to GNU/Linux as a complete platform including operating system, distributions, hardware, Free Software and Open Source, in manner as the opposite towards proprietary platform.